Billionaires of the future could avoid the inconvenience of having to sail and dock their superyachts as they travel from one luxury island to another and instead simply demand the island come to them. 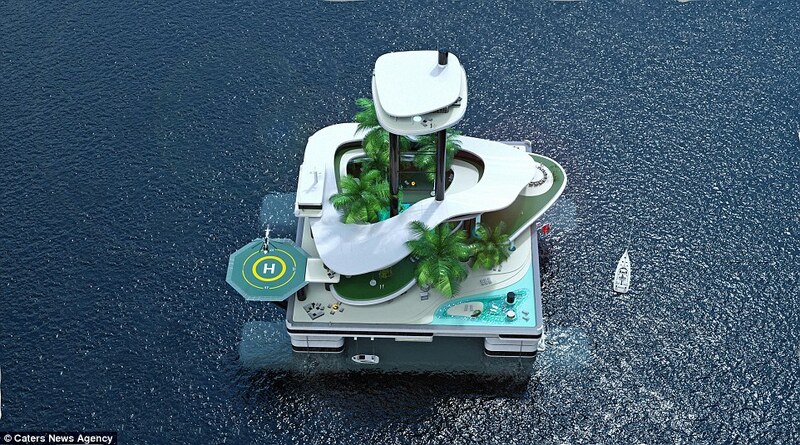 Designers have come up with plans for a floating private island that could be moved anywhere in the world - allowing its owners to simply weigh anchor and move their entire luxury resort whenever poor weather or inconvenience threatens their enjoyment. 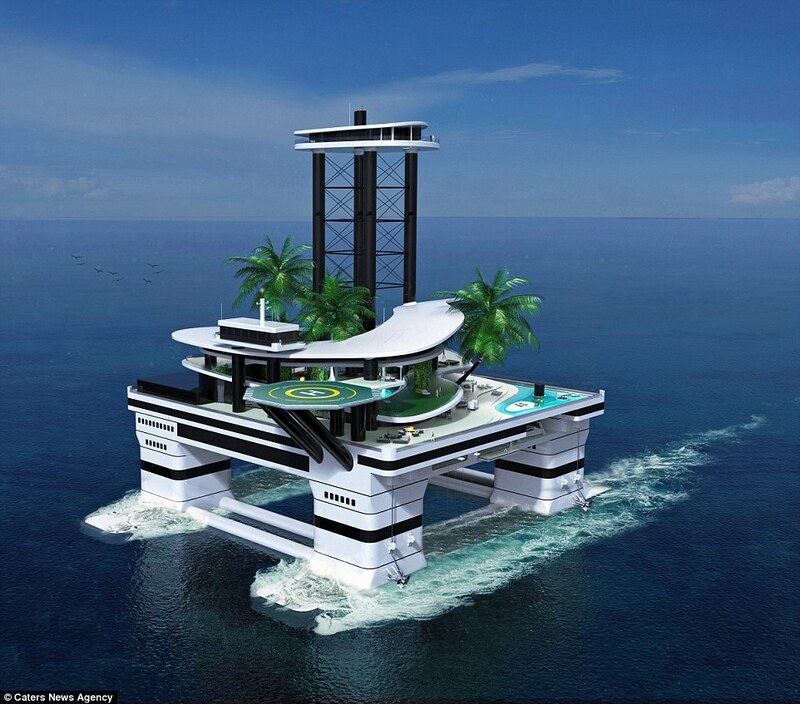 With a huge 80 metre high penthouse suite, waterfalls and a helipad, the movable island would offer its wealthy owner far more than the average superyacht, although it does also have a mini-harbour attached, should he or she want to keep their luxury vessel close at hand. 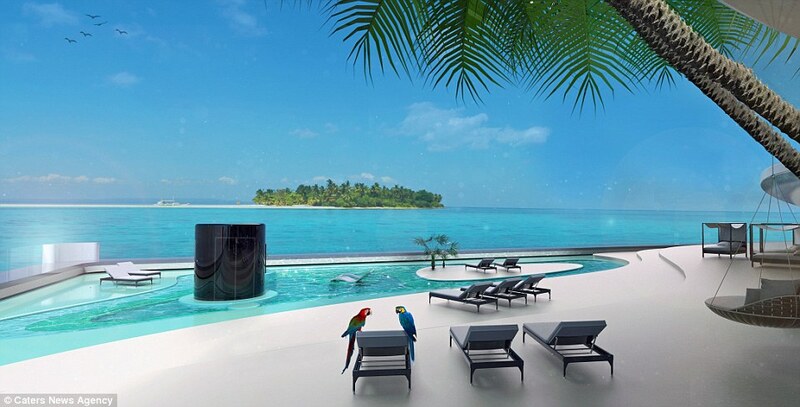 Owners of the island will be treated to 360-degree views within the penthouse, which can be accessed by an 80-metre elevator. 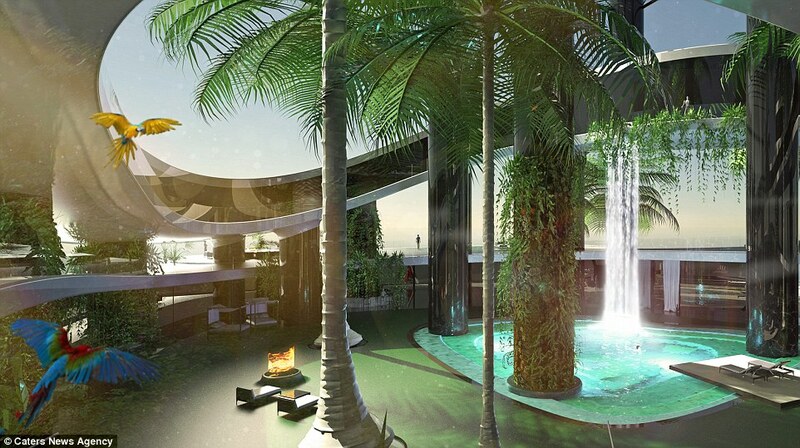 Around the complex, residents will find all the amenities that they would expect on a land-based tropical getaway - including a spa, gym, beauty salons, bar and a pool. The inclusion of vertical gardens, palm trees and even a shark-feeding station add more natural elements to the nautical island. Designers at Migaloo Private Submersible Yachts put together the plans, which the company insist could be built in the near future. 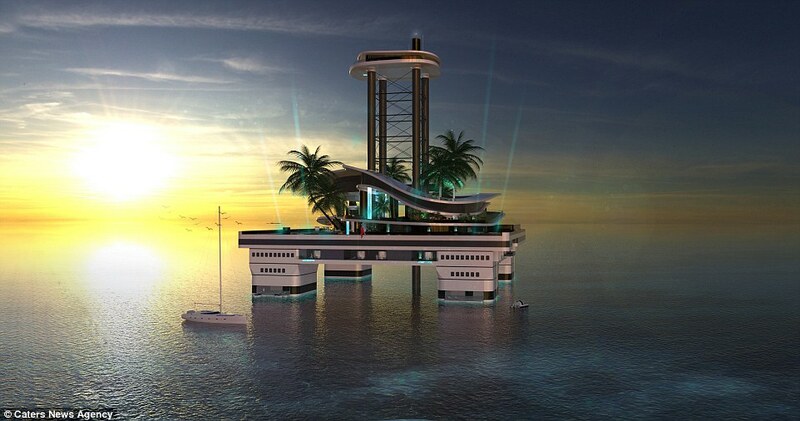 Based on proven technology that Migaloo have available, the company say the moveable paradise - known as Kokomo Ailand - would also be perfect for a high-class hotel, company headquarters or casino. 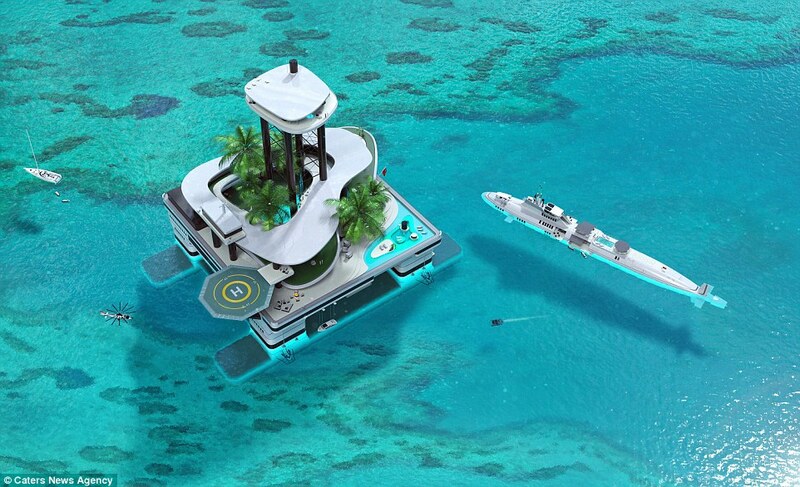 Were the island to be used for commercial purposes, the company have included space for crew members to live, as well as a helipad for easy access. All islands built by Migaloo will be tailor-made to their client's needs, the company said. Christian Gumpold, managing director of Migaloo, said: 'The response has been amazing - all of our clients love the idea. 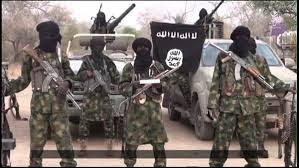 'We are currently negotiating with several clients who are very interested in the project. We developed an initial design concept to show our ideas and the main design direction,' he added. 'Our design team needed some months for this, but the actual details in the design - depending on the client's wishes - will be a much longer and intense process. This is common in the yachting industry,' he went on to say. 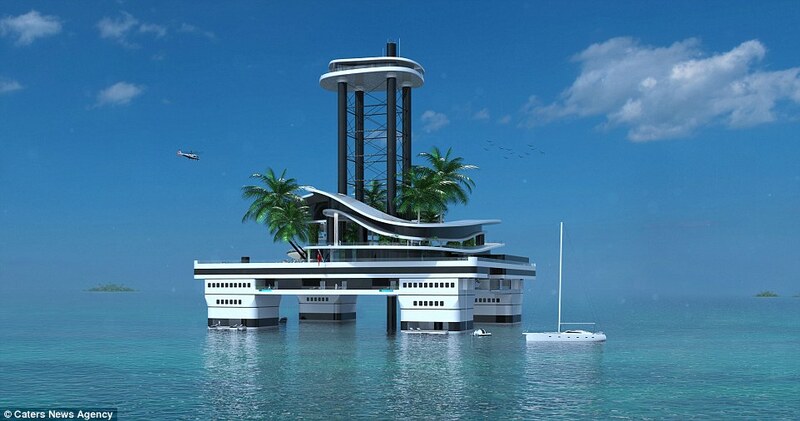 Mr Gumpold says that he expects living at sea to be huge trend in the future, adding that floating islands could be the perfect first step towards society adapting to this new way of living.